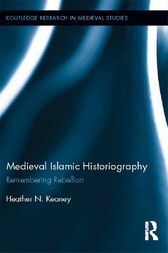 This book is a comparative analysis of the medieval Sunni historiography of the caliphate of Uthman b. Affan and the revolt against him. By comparing treatments of Uthman in pietistic literature and universal chronicles, the work traces the gradual silencing of more critical accounts in favor of those that portray Uthman as a saintly companion of the Prophet Muhammad. Through a comparative analysis of authors between genres and time periods, this book shows how authors were able to convey their personal perspectives on important religio-political tensions that emerged through the revolt against Uthman, namely the tension between Sunnis and Shiis, religious and political authority and appeals to maintain stability and unity vs. appeals for greater justice. This last debate, which in many ways began with the revolt against Uthman, has been repeated most recently in the Arab Spring. This work therefore provides readers with helpful historical context for important contemporary debates. Heather N. Keaney is an Assistant Professor of History at Westmont College, Santa Barbara. She is also the Co-director of the Westmont in Istanbul semester abroad study program, which she designed and led in its first outing during Spring 2012.